Practicing comparing single and double digit numbers with the garden comparisons pages. 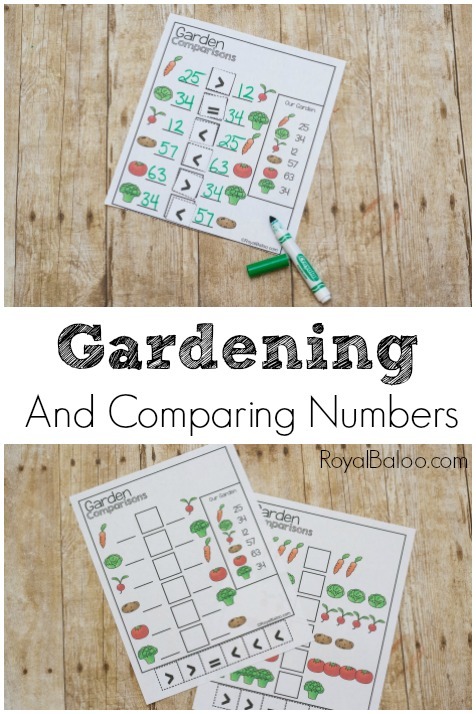 Using gardening and vegetables, comparisons have never been so easy.Gardening opens itself up to a lot of math and I think addition, subtraction, and comparisons are some of the easiest. While I doubt we will have 63 tomatoes in our little garden, I wanted to introduce this concept of comparisons. 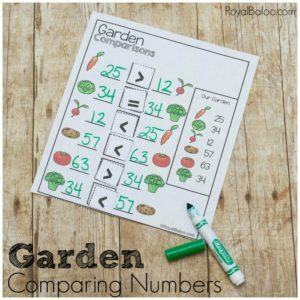 We love to do this using hands on techniques but there is nothing wrong with practicing using a page like this garden comparisons page. Actually, I like working with the numbers as it helps them to use abstract thinking to solve the problem. It’s also easier to compare the numbers 25 and 27 rather than looking at two piles that are incredibly similar. 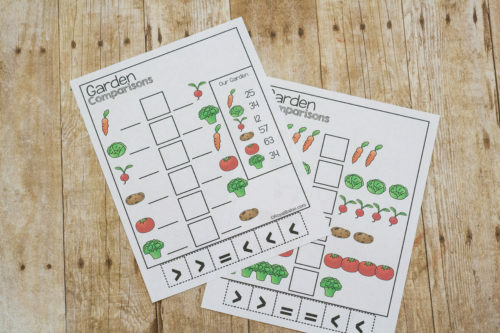 This printable is part of 6 days of Garden printables! There are more coming all week long including an awesome Free Printable Unit Study. The best way to keep up to date on all of it is by joining my newsletter! I love all garden types, but honestly, gardens that produce fruits and veggies are my favorite. There is nothing like providing yourself with food from a garden. I do not have the greenest thumb, but the boys are I are working together to make a garden. And who knows, maybe this will be the year that we actually produce some food. I have a feeling our comparisons will be more like “We have 1 tomato and two cucumbers…which is more” but that’s okay too. Learning to compare two amounts starts at a young age. I mean, many kids do it naturally when they want more candy than their brother, right? Kids naturally know what is more. But when it comes to figuring out what is more with abstract numbers instead of amounts, it can be tricky. And when they start getting into double and triple digits, it’s a bit trickier. Fortunately, it’s usually a matter of practice and they will get it. 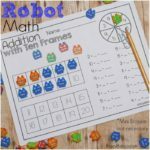 There are two pages in this set – one for younger kids working on single digit amounts (above) and one for older kids ready for double digit comparisons (below).